For more than ten years Soul Jazz Records have been exploring and documenting the sound of New Orleans Funk. 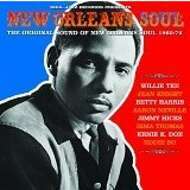 Now we turn their attention to the flipside of this musical coin - New Orleans Soul. These two musical forms share a lineage that begins with the city’s enormous rhythm and blues explosion in the post-war 1940s and 1950s. New Orleans Soul incorporated the soulful vocals of the gospel church, the driving beat of rhythm and blues, as well as traces of the second-line parade bands and the latinized rhythms of the city.